Years ago my momma had a friend that had really nice healthy looking skin and finally one day my mom asked her what she used on her skin and she said Milk Of Magnesia. So I started using it. I was always changing up my regimen because I had problem skin. 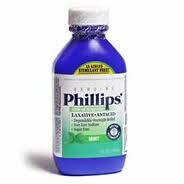 Milk of magnesia is a laxative that has been known to do a lot more than unclog the colon. I was recently reminded that Milk of Magnesia was great for acne. MOM dries up oil so that is what makes it so great for oily acne prone skin. After washing your face rub the milk on your face to get rid of any breakouts. Make-up trick: Rub Milk of Magnesia on your brows as a primer before you apply your make-up.